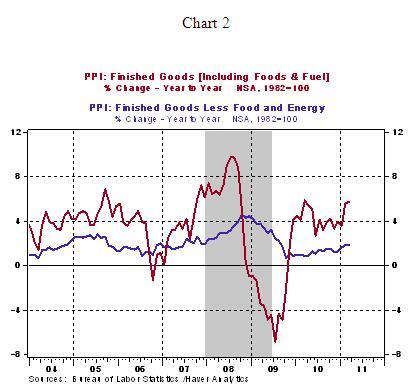 The Producer Price Index (PPI) of Finished Goods rose 0.7% in March following a 1.6% gain in the prior month. A higher energy price index (+2.6%) and a jump in prices of new light motor trucks (+0.7%) were the main drivers of the overall PPI in March. The 5.7% increase in gasoline prices and 2.7% gain in heating oil stand out among the price gains reported in the March wholesale price report. According to the Bureau of Labor Statistics, over 90% of the increase in the wholesale price index is attributed to the higher energy price index. The 0.2% drop in food prices helped to trim the overall advance of wholesale prices and recorded the first decline in food prices since August 2010. The core PPI, which excludes food and energy, moved up 0.3% in March, the fourth consecutive monthly increase; roughly one-third of this increase is from higher prices for cars. 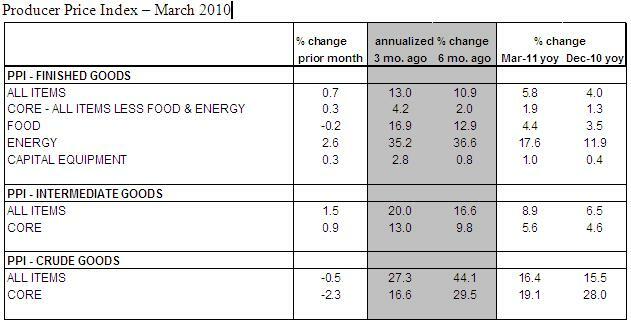 Further down the production pipeline, prices of intermediate goods increase while that of crude goods declined (see table alongside). The upward trend of wholesales price is positive and consistent with expectations about the impact of QE2 (second round of quantitative easing). It appears non-threatening, for now, if energy prices are viewed as a temporary event. The latest Beige Book noted that some firms have been able to raise prices to reflect higher input costs, particularly at the factory sector. But, others reported inability to do so largely due to soft demand conditions at the consumer level. The Fed holds two different opinions about inflation in the near term as seen in recent speeches of Fed officials. The policy statement of the April 26-27 FOMC meeting is awaited for the Fed's current assessment of economic conditions. Also, the Fed's preferred measures of inflation are from the personal income report , scheduled for release on April 29.